Over the next few days the Bouchercon Mystery Convention will be taking place in St. Petersburg, Florida. More than 1,500 mystery writers and fans will be attending. Karin Slaughter will be the guest of honor. It will be a fabulous time, but I had to bow out this year because I will be having a different sort of fabulous time. I will be sorting toys for my church Attic Sale. I am the chairperson of the Toy Department, which is not an honor I actually had to fight for. But it’s an honor nonetheless. That means that I spend hours sorting through black trash bags and trying to figure out what that thing is that looks like a bean ball and how much can charge for it? The miraculous part about this whole exercise is that we raise a huge sum of money. 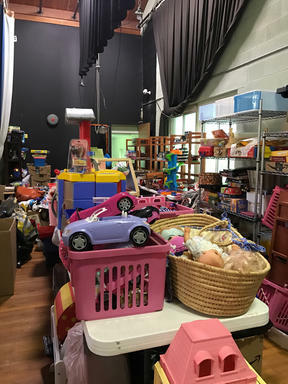 The Attic Sale as a whole raises about $50,000 and my little department raises about $2,000. (You can only charge so much for a used Barbie car.) Every penny that we raise we donate. We give to local organizations that help kids in our community, to groups who help prisoners trying to get acclimated after they get out of jail, to groups who help veterans find homes. We donate to people who’ve been hurt by natural disasters. Organizations abroad. You name it, we give to it. Or if we don’t, we will, if you ask nicely. My favorite part of the whole exercise is the way the whole church comes together for the sale. It reminds me a little bit of that scene in the movie Witness where they’re building a barn. Except no Harrison Ford. And there is also a food department that sells the best ham salad sandwiches I’ve ever had. So hugs to all my friends at Bouchercon. Hopefully I’ll see you next year in Dallas. And meanwhile I’ll be buried under toys.